Vecoplan is a worldwide leader in storage technologies for waste, biomass and other bulk materials prior to being processed as alternative fuels or fed into a single stream recycling facility. In addition to simply storing material, storage systems from Vecoplan include seamless receiving of material and unloading of material to be fed into the processing stream. While Vecoplan storage systems include above and below ground bunkers and silos, it’s the diversity of innovative loading and unloading technologies that Vecoplan incorporates into their systems that sets Vecoplan apart. Even more important is the field-tested experience that enables Vecoplan engineers to know which technology to use, when to use it and why to use it. Push rod systems, gliding floor discharge systems, and metering screw conveyors are among Vecoplan’s comprehensive scope of storage unloading technologies. In addition to these traditional technologies, Vecoplan exclusively offers their bunker storage load/unload conveyor system. 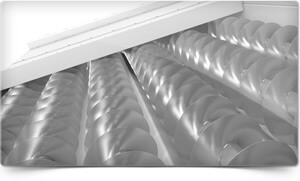 Invented by Vecoplan, this system moves both lineally in an x-axis horizontal direction and vertically in the y-axis up and down direction. 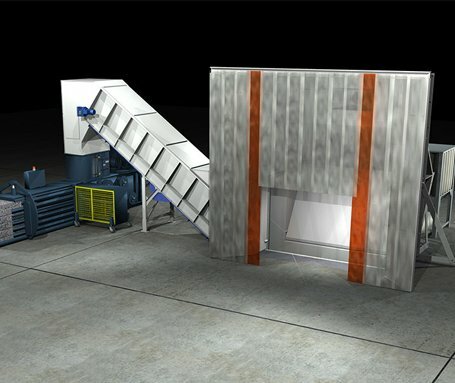 This allows the system to load bulk material from the bottom up and unload material from the top down and because it’s above the stored material it eliminates the need to unload material for system maintenance. Vecoplan also supplies uniquely efficient technologies for continuous 24-hour discharging that can be used for heating and power generation installations, loading and unloading vehicles from silos, and also for discharge from bunkers. Vecoplan is your source for storage solutions. Our push/pull rod discharger is designed for large storage capacities and discharge rates of up to 300 m³/h. It is particularly suitable for continuous feeding of boiler systems. 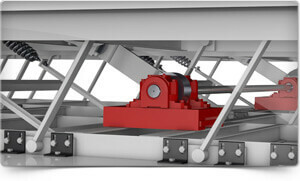 Our screw discharger has an impressive discharge capacity of between 1 and 400 m³/h and consists of several screw shafts in a shared trough construction. 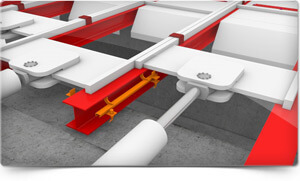 One or two discharge openings facilitate optimum dosing of material supplied to the next process. Vecoplan delivers dosing expertise. Dosing or metered feeding of material into a system is vital to the overall efficiency and profitability of your plant. Although simple in concept, provide the proper amount of material at the proper time, doing it correctly requires a sophisticated understanding of all the variables that can affect accomplishing it. Vecoplan provides this understanding. Real world experience has taught Vecoplan that a broad spectrum of variables affect metered feeding. These include, but are not limited to, the physical properties of the material being fed, the climate and other location specific conditions the material is being fed under, and the particular demands of the system or process that the material is being fed into. And, from experience, Vecoplan understands that these variables can and do change. Vecoplan combines their understanding of these variables with their expertise in dosing technologies to ensure the systems they engineer are efficient, durable and cost effective. Vecoplan’s dosing technologies include metering vibratory conveyors and tables, metering belt conveyors, dosing silos via screw or auger discharge, and metering push rod discharge. Vecoplan delivers cutting edge technologies for the regulated feeding of wood, biomass, process engineered fuel, plastics, paper, and other bulk materials for combustion. 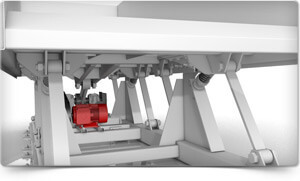 Our vibratory dosing feeder QS feeder is a receiving tank for regulated feeding into downstream conveyors. The vibratory table is mostly applied in saw mills for the lateral conveying of slabs and splinters as well as waste wood.